A new product that we are fast became crazy for. The label says it's for 'seafood' but we also love it on any barbecue meats. Steaks, eggs, vegetables -- with anything really. We even pour it over steamed jasmine rice. Use this nice-sized bottle for generous use. It's really spicy, having a nice lager on hand is recommended if you enjiy beer -- we love Fosters to go with spicy Thai cuisine. We loved drizzling just a bit over fresh small raw oysters and eating them straight away. Ingredients: water. 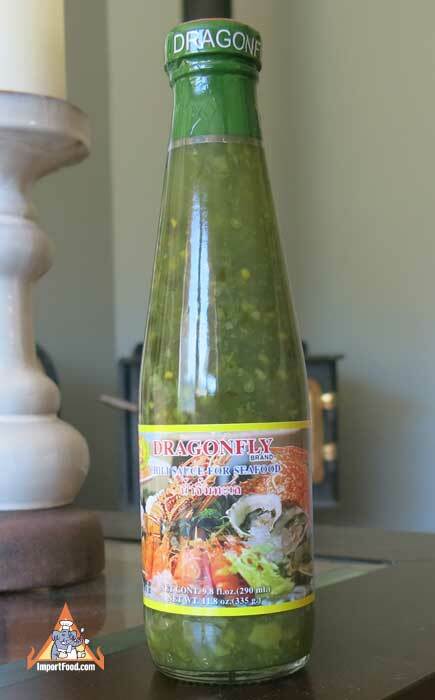 sugar, fish sauce, green chilli, garlic, vinegar, salt, lime juice, corriander, xanthan gum, sodium benzoate. Product of Thailand.